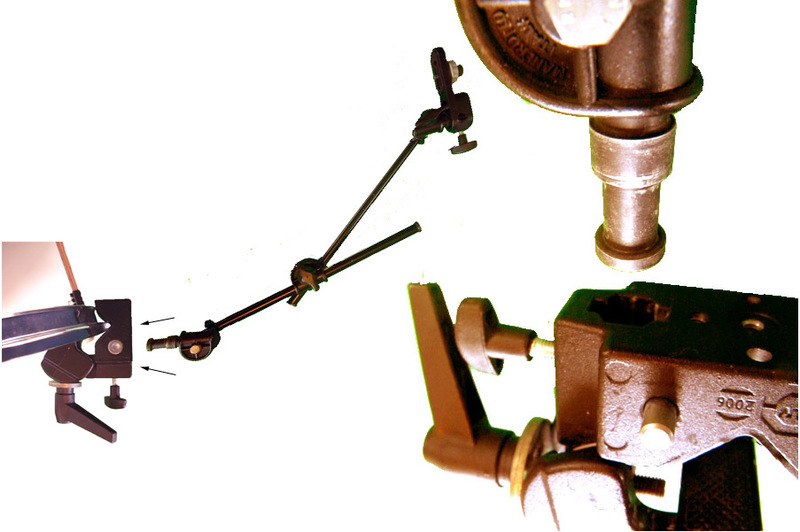 Shekeré is a recent piece and yet some of the technologies used for its original version are now obsolete. The following patch is designed to work with multiple midi and keyboard devices and you should contact me if it isn’t clear how to support your device. 1) Click on keyboard on/off toggle switch to activate keyboard control, or alternatively on Midi. 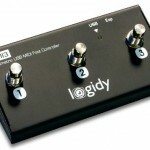 Be sure to configure your midi pedalboard. 2) On the keyboard, Use spacebar to move forward, the “b” key to move back in the sound groups. The “l” key to activate and deactivate loops. 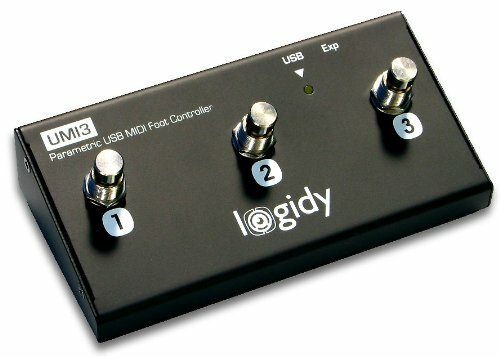 If using midi, configure your patch to output noteon as 100, and pedals 1 through 9 to output notes 0 through 8. note 9 turns looping on and off. 3) Make sure your input level for the mic and the output level are ok. Attacks of different intensities trigger different sounds, loops stop when you change sound group or stop the loop. 4) Test that you don’t have any feedback from the speaker into your mic by activating a sample without looping. If your computer keeps outputing samples without you playing anything on the shekere, then you either need to lower your gain or place mics and speakers in a different configuration. 5) The intensity of your attacks triggers different samples. The limits for the range of activation are controlled by lims 1 through 5. Nothing happens below lim1, the first sample is triggered by attacks between lims 1 and 2, and so on. Tune these lims to your playing and save the configuration with the save button. an intensity measure is provided as a reference. 6) Be sure you have sound configured correctly. The patch is sending 4 channels out by default, 1 and 2 are a front stereo image and 3 and 4 are a back stereo image (traditional quad). Click on stereo if you’d like to rehearse with two speakers. This entry was posted in Recipes | recetas on May 3, 2014 by admin. This is a very simple patch. Essentially each microphone is sent through a ring modulator and then to an output. There are five cues. You can move through each of these cues with the spacebar. Cue 1 happens at bar 1, cue 2 @ bar 42, cue 3 @ bar 61, cue 4 @ bar 81, and cue 5 @ bar 89. Lastra Fa goes to [adc~ 1], Lastra Mi to [adc~ 2], and Lastra Do# to [adc~ 3]. click here to DOWNLOAD the source and a help patch. pd2ly is pure data to lilypond or pitch-duration to lilypond. It is in a very early and experimental version although it is currently working consistently. I have not been able to use two in the same patch, but I generally use a generative patch to make .txt files and then use pd2ly to convert them into lilypond files. Btw, negative pitch numbers create silences. This entry was posted in Recipes | recetas on April 28, 2014 by admin. 1) download gem binaries for os x and gem source / only source in linux. 2) Create a project in /extra just like the other projects there. 7) put the project folder in the path of Pd. This entry was posted in Recipes | recetas on October 13, 2012 by admin. This entry was posted in Recipes | recetas on November 5, 2011 by admin. First you’ll need a copy of Pd or Pure Data for your operating system. In the event that you are using the same camera that I am, the PS3eye, you will also need to make sure that you have the correct drivers for your operating system. A small tutorial on how to install these drivers is found here. 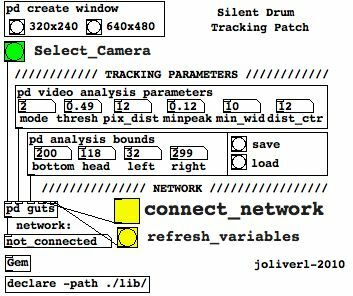 Tracking and sound patches are separate for processing reasons and to allow sending the tracking data to other programs such as Max/MSP or others. It is currently sending messages through netsend/netreceive. In the main.pd patch there is a select camera option. This is only helpful in OS X. It will open a dialog to choose the camera and frame rate, as long as you have the correct drivers for the PS3 EYE camera. In this dialog you should also select the 320×240 resolution. A window should be created automatically, but you can create a window in the “create window” dialog at the top. Most video tracking parameters are already set in advance for 320×240 resolution. 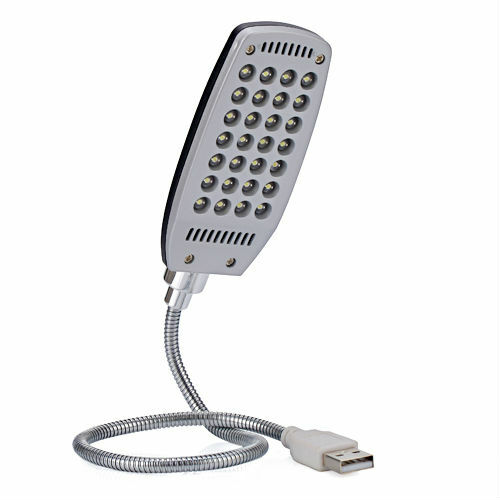 You will only need to adjust the threshold to your own lighting situation. The other variables are left there in case you want to explore what they do. You’ll also need to adjust the bounds to the area of analysis desired. 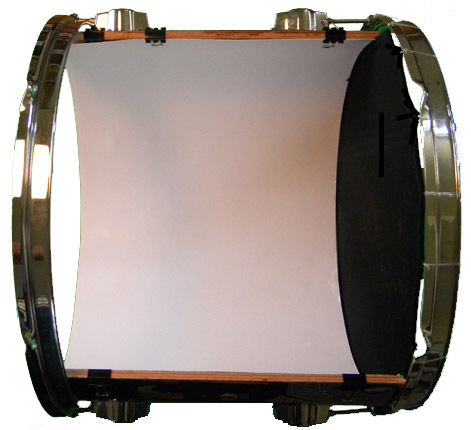 Right and left should reach the edges of the drum (of the open area). top should be right below the spandex head and bottom should be adjusted to the lowest the head can be pressed. Once variables are set, press the “save” button to save the variables. They will be loaded automatically the next time you open the patch. Once the receiving (netreceive) patch is open, press connect to send the data. The output of this patch is described here. You can also consult the pix_drum-help.pd patch in the /src folder. This entry was posted in Recipes | recetas on November 9, 2010 by admin. In this post I will try to explain in as much detail as possible how to build a MANO Controller. The MANO Controller is an open source instrument and the code for pix_mano is released under the GPL license. Compositions for the MANO Controller. download the source code and patches for pix_mano. documentation is on the works… | bájate el código patches para pix_mano. documentación en proceso. This entry was posted in Recipes | recetas on October 17, 2010 by admin. 1) The first step is to cut the drum in 3 parts. The reason to do this is two-folded. On the one hand it needs to have one third of it completely open so as to let the camera see the shape of the spandex head when it deforms and the second is to make a device with which one can travel. 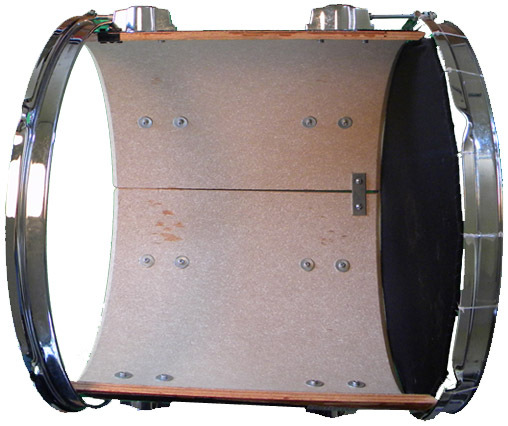 If you bought a 14 inch drum, the circumference is about 44 inches. I cut mine in three sections of around 16, 15.5 and 12.5 inches. I left the 15.5 inch section out as the open section. In figure 1 you can see one of the sections. 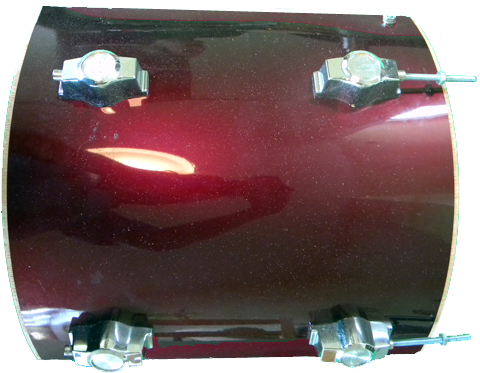 The drum you bought should have included the body of the drum and two metal rims with their respective screws. It will also probably come with one or two drum heads which we will not use. 2) the next step is to make two small holes (that coincide with the metal piece of fig 6 in the parts list) at the top, or what we want the top to be, so that they can be held together as seen in figure 2. Attach them together with two screws and bolts. You can put some washers there if you want. 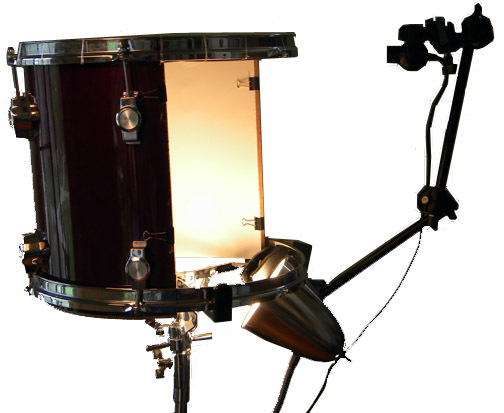 We should now have 2/3rds of a drum. Figure 3. Bottom rim and screw. 3) Now we need to attach the lower rim to the 2/3rds of a drum we achieved in the previous step. Use the rim and screws that came with the drum. The drum key will come in handy for this part. It should look like Figure 3. Note the rim is upside down. Regularly, rims are used to stretch a drum head, we on the contrary, are using it to get the drum to be compact/solid/strong after cutting it in pieces. 4) The next step is to prepare the spandex head and the rim. I used two layers of spandex fabric and a thick elastic band. Choosing the spandex is not straightforward. I just went to a textile shop and chose one. The key is that it deforms easily, but recovers its flat shape very fast and doesn’t wear too much over time. Form a circle with the elastic band, then saw a fold of the two layers of spandex over it and saw them as shown in figure 4. After sawing the spandex, attach it to the top rim with the nylon (I use it because it is resistant, but you can use something else). 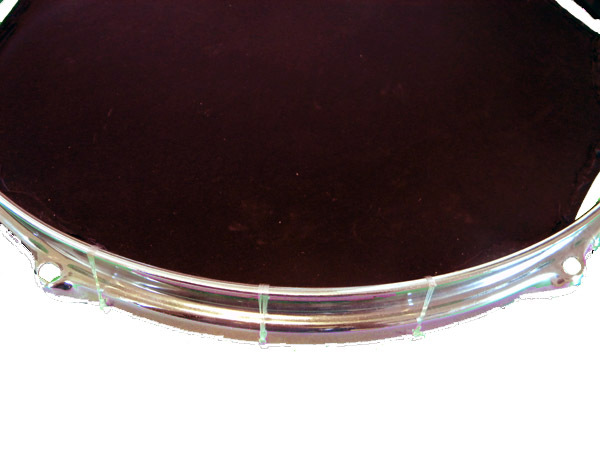 Make sure that the spandex head is stretched at the lower level of the metal rim as seen in figure 5. I’ll post new pictures when i get some time to build a new head. The top rim needs to be adjusted to the drum body. Use the cut rod and nut numbered 2 in fig. 4 of the parts list. After screwing the rod into the body of the drum, use a nut to set the level at which the rim will rest as shown in figure 6.1. 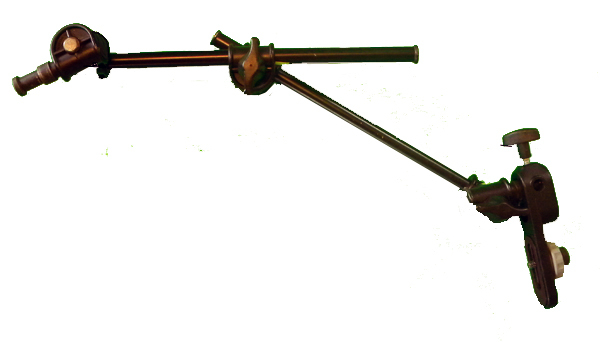 Fit the rim in the rods until it rests on top of the nut as seen in Figure 6.2. 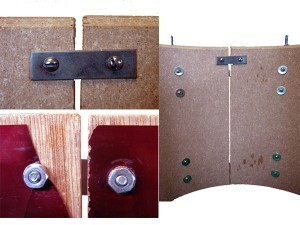 Then adjust the rim with the nuts and cap (shown in figure 5 of the parts list) as seen in Figure 6.3. 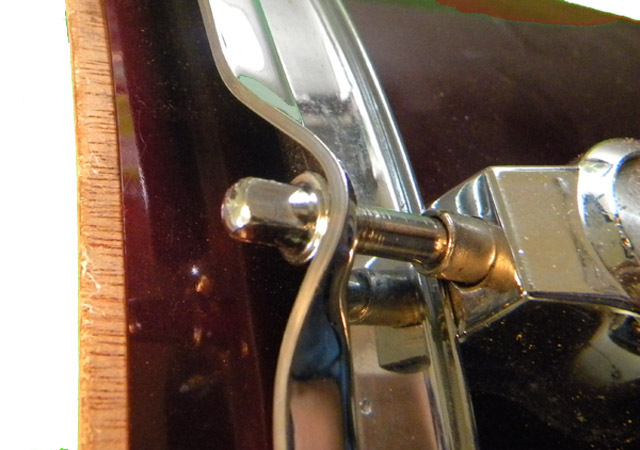 The lower part of the rim needs to be fixed at the level where the body of the drum ends. The result should look like Figure 7. Once the structure is built, we need to prepare for tracking. Get the white cardboard (it should be a flexible and light reflective thick white paper). Cut it so as to cover all the interior of the drum.Once you have it cut, hold it to the body of the drum with paper clips as seen in Figure 8. 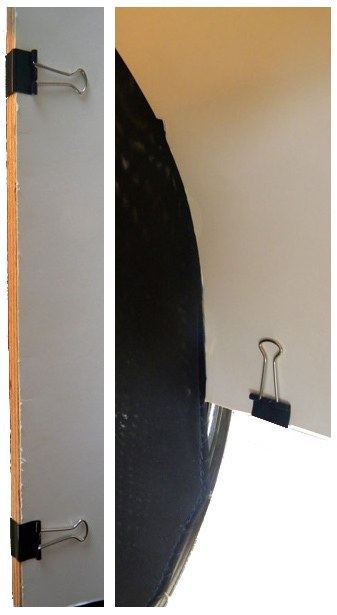 It is important to make sure that when you press the spandex, it doesn’t get stuck with the white cardboard/paper. The result should now look like Figure 9. Figure 10. 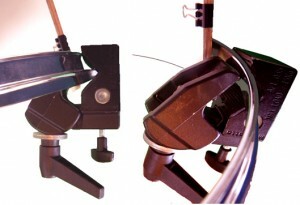 Two views of the Clamp in the Lower Rim. At this point the drum structure is ready. We now need to attach the clamp and arm. 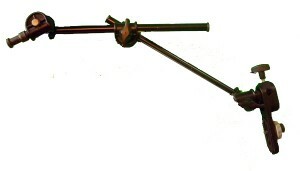 the clamp must be attached to the lower metal rim as seen in Figure 10. I put it to a side to allow visibility by the audience, but, it can be set at any part of the rim. It is crucial that the clamp does not move at all. 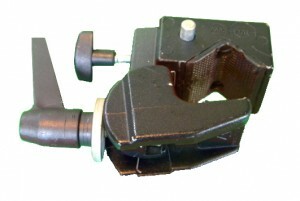 Once the clamp is tightly attached, we need to insert the arm into the clamp as seen in Figure 11. The camera needs to be prepared in advance. Remove the base of that comes with the PS3eye camera. You can do this by removing the plastic covers that are on top of the screws, opening it up (carefully! ), removing the base, and screwing it up again. You can see someone doing it in the embedded video below. We are not interested in removing the IR filter, just so you know how and what to expect when opening the camera without breaking it. 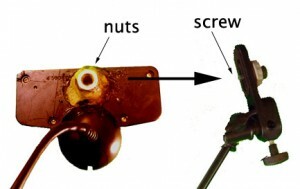 Use two nuts (that are the same size as the screw in the bracket) and stick them to the back of the camera. Use very strong glue, I use a strong weld. Superglue and the like won’t be enough. The camera then should look like it does in Figure 12. Finally the camera should be fixed by screwing it to the bracket. We’ll calibrate and position it correctly in the tracking software section. 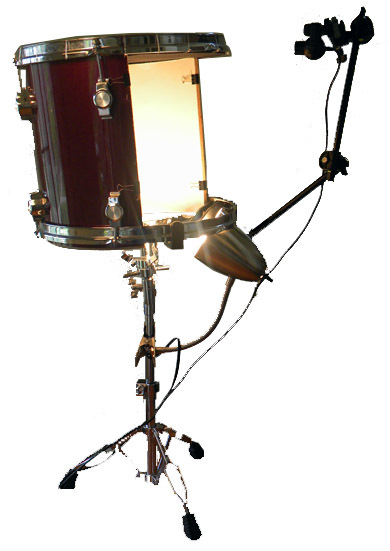 We can now attach the drum to the stand and attach the lamp to the stand as well and we have all the hardware in place. Below are some images. This entry was posted in Recipes | recetas on October 13, 2010 by admin. The PS3eye is a fast usb2 camera with respectably good image quality. In any case it is a great camera for the price! Linux drivers are available from http://kaswy.free.fr. In Fedora, I use the MT gspca modified driver V0.5 and compile it as explained in the driver’s files. These steps have worked out of the box in fedora 10 and 11. You may have to fix things in other releases/platforms, for example, I’ve had a lot of trouble in Fedora 13. See http://nuigroup.org on the web to see some possible solutions. Note: to make GEM work with the ps3eye, it must be compiled against libv4l-dev or libv4l-devel, depending on your distribution. Just run yum install libv4l-devel in fedora. Then recompile GEM. I use the latest cvs build of the macam drivers. The regular driver won’t allow for higher (>30) frame rates.